Want to try a new makeup look or perfect the basics? Either way, getting the right look starts with the right tools—and a proper set of brushes is essential for getting the most out of your makeup. Whether you're a beauty beginner or a makeup pro, you may find it hard to get a straight answer to the question: What makeup brushes do I need? The vast selection of makeup brushes on the market can be overwhelming. Different brush kits offer so many options: some all for eyes, some for both face and eyes, and some just for face. The holy grail of brushes is a good foundation brush, like this Evalina buffing foundation brush. It should be made of synthetic fibers that don’t have a cuticle, so you can use them with liquid or cream products (like foundation and concealer) and they won’t trap makeup. If you’re looking for a brush that’s perfect for stippling and blending liquid products, a flat-top foundation brush is the way to go. Recommended technique: Use this brush to apply foundation and concealer for a smooth, flawless finish. Stipple on your makeup; apply liquid foundation or concealer by dotting it on your face. Recommended technique: Use the flat brush to apply concealer to blemished areas and under your eyes. Use the foundation brush for smoothing and buffing. The Evalina Highlighter Brush is perfect for highlighting powder on your cheekbones, forehead and nose. Recommended technique: Flare your highlight by condensing the pigment and pinpointing exactly where you want to place it. A more concentrated highlight reflects light better, amping up the overall effect. The Evalina blush and contour brush delivers smooth and precise application, and easy blending for your blush and contour. Recommended technique: Buff your blush and contour with the rounded tip of the brush. Swirl it into a pressed powder compact and apply it in a circular motion. This technique makes the makeup melt into your skin so it looks seamless and natural—and it will last for ages. The Evalina eyeshadow brush will give you full coverage. Use it to apply the perfect base on your eyelids, then to blend harsh edges as you go. Recommended technique: Use the soft, dense bristles to sweep your lids for a natural look, or use it to dab eyeshadow on for full coverage. Tapered blending brushes like this crease brush are a must-have. The dense bristles are ideal for detailing along the lash line (both top and bottom) and for the crease. Recommended technique: Buff and blend. The precision tip concentrates product when applied directly to the area, and its rounded tip can also blend seamlessly. The Evalina eyeliner brush has a fine, tapered point fits perfectly along your lash line. Use it with gel or shadow. Recommended technique: Sweep and drag the brush along your lash line, always keeping the pointed tip facing out. The Evalina eyebrow brush is a longer tapered brush that works well for all brow shapes. Recommended technique: Use the top of the brush to fill in, reshape or frame brows. The saying “you are only as good as your tools” is something every makeup artist knows to be true. 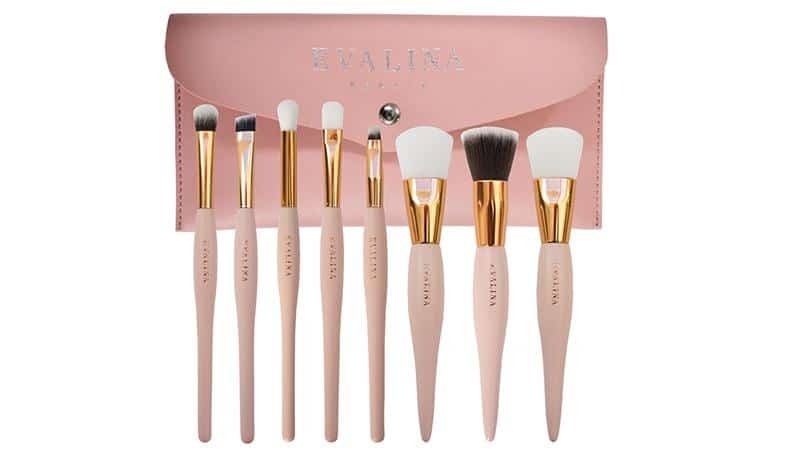 Cruelty-free, vegan, makeup artist designed and tested, Evalina brushes have been created to work with all our products, whether wet or dry. Each tool has been crafted to make application as easy as possible.